Kenosha Beef International of Kenosha, Wis., is recalling approximately 3,960 pounds of beef patties. The products may contain milk, in the form of cheddar cheese, an allergen, and bacon, which are not declared on the label. 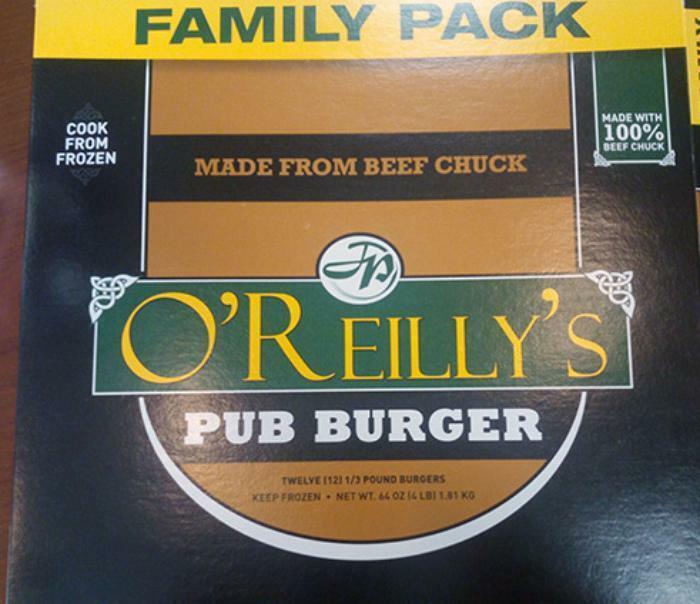 4-lb retail carton containing 12, 1/3 pound burgers of “JP O'REILLY’S, PUB BURGER, FAMILY PACK, MADE FROM BEEF CHUCK,” with a sell-by date of 01-10-18. 24-lb cases of “JP O’REILLY’S, BACON & CHEDDAR BEEF PATTIES” with sell-by date of 01-10-18 and case codes of 0614KS42065, 0614KS42066, 0614KS42067, 0614KS42068 and 0614KS42070. The recalled products, bearing establishment number “EST. 425B” printed adjacent to the sell-by date on the retail carton and inside the USDA mark of inspection on the shipping case, were shipped to retail locations in Connecticut, Delaware, Maryland, New Jersey, New York and Pennsylvania. Consumers with questions about the recall may contact Peter Policastro at (732) 515-9314.